Browse our documents and publications covering G-Watch Monitoring Manuals, Governance Reform Studies, Political Democracy and Reforms (PODER) Publications, and Vertical Integration Research. 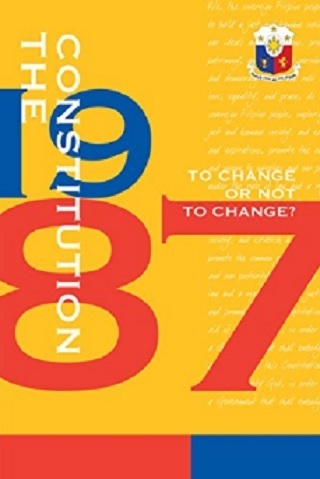 The 1987 Constitution: To Change or Not to Change? Twenty-five years after its ratification, the 1987 Constitution has survived serious attempts to change it during the presidencies of Fidel Ramos, Joseph Estrada, and Gloria Macapagal Arroyo. What were the reasons for the attempts and why did they fail? For persons and organizations with valid reasons to explore Charter Change, what are the available options? What is a systematic way to explore and pursue it? These are some of the questions this book examines and answers. 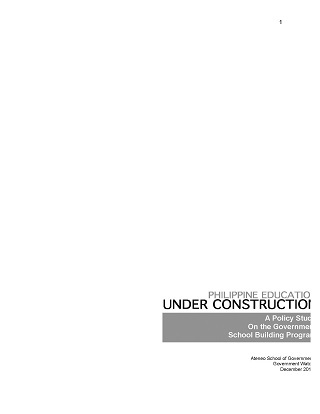 This policy study aims to identify key issues in the implementation of the government’s school building program, focusing on the DepEd-led School Building Program for schools experiencing acute classroom shortage and the DPWH enforced Regular School Building Program which is in the ambit of Republic Act No. 7880 or more commonly known as the Roxas Law. 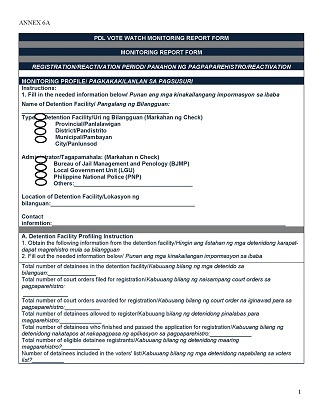 This provides an application of the G-Watch monitoring in human rights compliance, particularly on the right to vote of the detainees (or PDLs, Persons Deprived of Liberties). 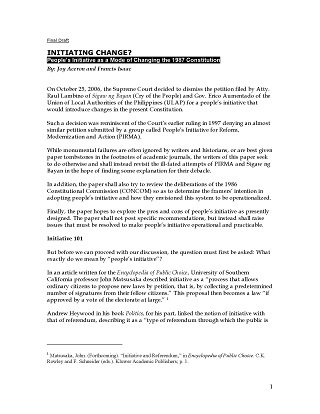 A chapter by La Viña and Aceron in the book, Agenda for Hope: Democratizing Governance. 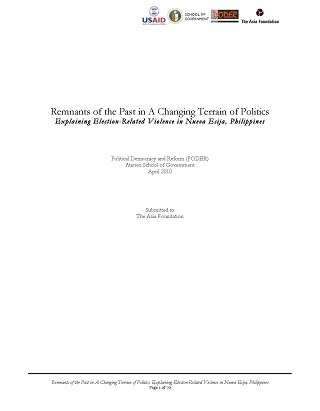 This chapter proposes a movement for nation-building among reformist leaders from the different local government units (LGUs), the bureaucracy, the citizens’ groups, and even among the circles of some modernizing elites, that would develop a system of synergy and interdependence to be able to connect their efforts, share a common vision for the country, and eventually execute a coordinated strategy of capturing power at the national level. 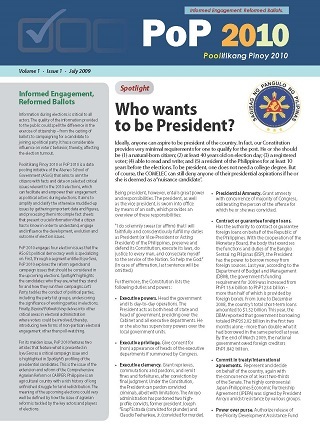 PoP 2010 is a data pooling initiative of the Ateneo School of Government (ASoG) that aims to arm the citizens with facts and data on candidates for and selected critical issues relevant to the 2010 elections, thereby, facilitating and empowering their engagement as political actors during elections. 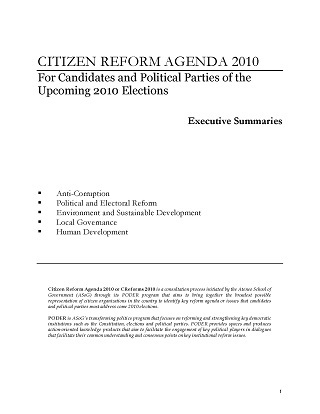 Citizen Reform Agenda 2010 or CReforms 2010 is a consultation process initiated by the Ateneo School of Government (ASoG) through its PODER program that aims to bring together the broadest possible representation of citizen organizations in the country to identify key reform agenda or issues that candidates and political parties must address for the 2010 elections. 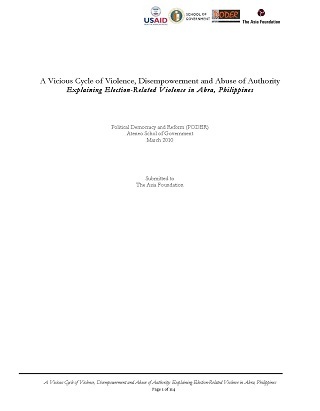 The study is a cause-and-effect analysis on election-related violence in Nueva Ecija. It seeks to explain the situation of election-related violence in the said province by adopting a action research that looks into its causes and implications, as well as the definitions and types of election-related violence that are present in the province. The study is a cause-and-effect analysis on election-related violence in Abra, which focuses on three possible causal factors: historical, socio-cultural and institutional. It utilizes three analytical lenses or perspectives, namely institutional analysis, power analysis and socio-cultural analysis. 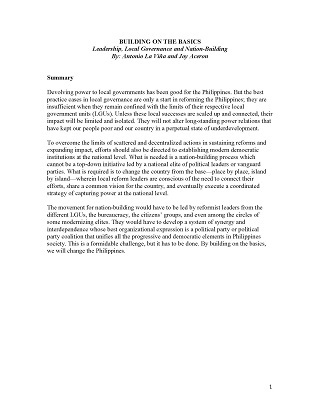 This paper explores the pros and cons of a people’s initiative, by revisiting the attempts of PIRMA and Sigaw ng Bayan, and examining the barriers to making it operational and applicable. 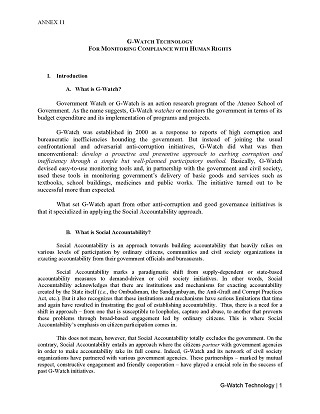 This is an attempt to superimpose the Human Rights-Based Approach (HRBA) to the Social Accountability approach of G-Watch.